There are lots of changes including a split into more projects and renames of public interfaces. So this release will break some existing code, sorry for that! I've seperated the Kinect SDK part into its own DLL called CCT.NUI.KinectSDK. This code was in the CCT.NUI.Core project before. Like this the core project needs no more reference to Microsoft.Research.Kinect. The next step will probably be to introduce a seperate project for OpenNI. Until now it was necessary to first create a bitmap and transform that into an image source later to be used in WPF. Now there are data sources that return WriteableBitmaps that can directly be assigned as WPF image source. The WPF sample project now uses these new data sources and also draws the layers with WPF elements. Next step will probably be to work on performance again. Things seem to have become a bit "sluggish" over time. It smooth the line but it is still not good enough. And 1 downside is, after the gaussian blur, my finger gap tend to mix together. Before it was quite clear. I haven't worked on the algorithm for some time.. was busy using it :-) But I'll have to improve it sooner or later. Or Microsoft or PrimeSense will release one that's better anyway. 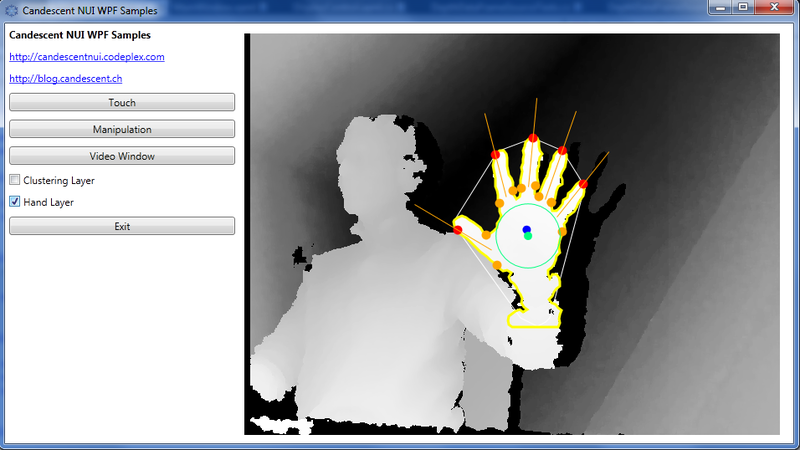 I'm using the version KinectSDK-v1.0-beta2-x64.msi of sdk of Microsoft.